First Line: First he thought it was a tidal wave. 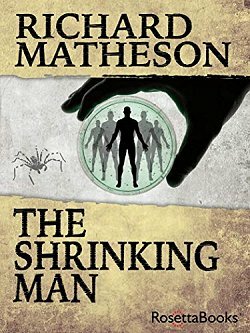 One of my favorite movies of all time is The Incredible Shrinking Man, and one of my favorite writers-- when I was a tween and a teen-- was Richard Matheson. Matheson wrote Rod Serling's introduction to The Twilight Zone (as well as a few episodes) and many other short stories and books that were turned into film. I grew up liking what the man could do with my imagination. The novel The Shrinking Man is the basis for the movie I mentioned above, and I wanted to see how they compared. If you're talking to a book lover, you will normally hear that the book is always better than the movie. But that's not true. In this case, the film is superior to the book, and it's got everything to do with the main character, Scott Carey. While out on a boat, Carey is covered in a mysterious, glittering mist that he later finds out is part radiation, part insecticide. He begins to shrink. Steadily. Until he lives in fear of the family cat. But he continues to shrink, until-- trapped in the cellar of their house-- he finds himself continually fighting off a very determined spider. This book can be very interesting to read. How can a man who's literally shrinking away to nothing be able to provide for his wife and his daughter? How are his wife and daughter going to be able to cope with this situation? There's a lot of good food for thought within the book's pages. Unfortunately, one thing almost completely ruined The Shrinking Man for me-- Scott Carey. Now, don't get me wrong. I tried to cut Carey as much slack as I possibly could. After all, how on earth would I know how I'd react if the same thing happened to me? But it was a very difficult thing to do. Scott Carey is one of the most juvenile, thoughtless, self-centered, violent-tempered, unlikable, whiny characters I've come across in years. It got to the point where I was rooting for the spider to win but feeling guilty about it because the spider probably would've suffered from horrible heartburn. So just remember. The book isn't always better than the movie. The Shrinking Man is a case in point. Hmm....it's interesting, Cathy, that the film was better than the book this time. But I can see why. Still, it's such an interesting premise, and probably worth reading just as a way of adding to one's perspective on the film. It was worth reading, precisely for the reason you mentioned. I remember that movie vividly! The little guy fighting the spider (guess that was it?). In black and white. I've not ever read any book or story by the author. Not sure why. Pre-King stuff, but I don't think I had ever read horror-ish type books before Stephen King and my parents didn't like The Twilight Zone. Wouldn't let us watch it. Think I watched this movie with a babysitter. Ha! As to the book and movie and which is better, I have a few that I saw the movie first, tried the book and then put the book aside. Practical Magic and How To Make An American Quilt are two I can think of quickly. I have to admit that there are several movies based on books that I watched and then didn't bother to read the book. So many books, so little time, and all that! Good film. Can't image it in book form. It makes a much better film than book in my opinion.